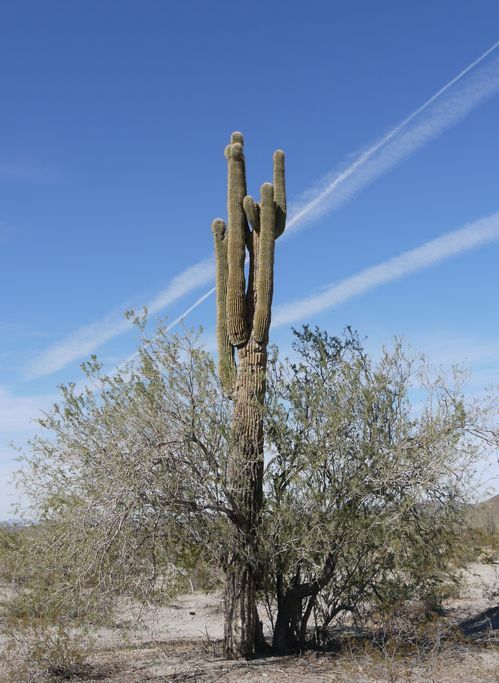 In the desert distances can be very deceptive, as Ken explains. Often a bit dull, the odd train lends a little excitement.. 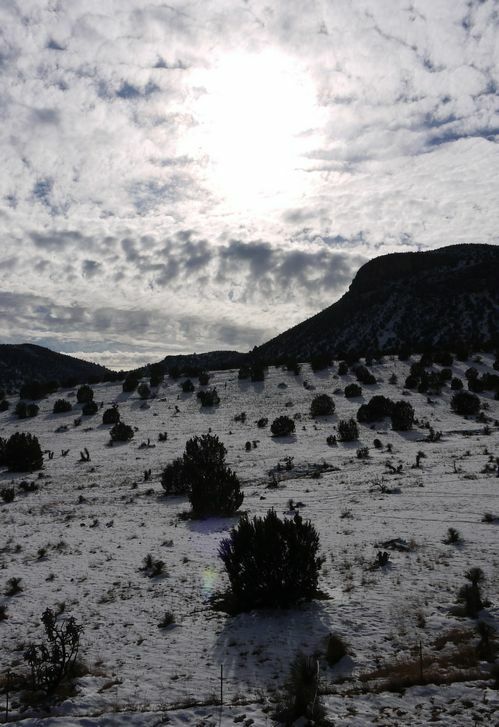 Snow dusted desert, close to Mimbres, New Mexico. At about 6,000 feet. The sign had said "Welcome to Arizona. The home of the Grand Canyon". I’d have taken a photograph but jaywalking on the Interstate lacked appeal. Besides, it’d hadn’t taken long to realise that a more apt description of State should include prodigious references to gravel and cacti. There was a lot of both. An awful lot. I’d seen quite a few Recreational Vehicles parked up in the desert. The attraction alluding me. All the appeal of caravanning in a gravel pit. Reliant instead on my father unlocking the mystery. His suggestion that they were probably Alaskans wintering down south. Ken is trapped by wind. This time no mini-donuts. Rather, the meteorological stuff. Spending the day in the especially small town of Ocotillo. On the edge of the Yuha desert. Several prolonged bouts of the dreaded traveller’s lurgy, possibly compounded by anti-diarrhoeals of dubious efficacy. Some difficult riding conditions – gale force winds and electrical storms – had also contributed to making progress slower than anticipated. Margin for error, unforeseen problems, now small. Uncomfortably so. I’d enquired about a visa extension. Knew I was eligible. But, it seemed, I could only apply two days before expiry. Quite a way off, but the notion of being obliged to leave it to the last minute wasn’t in any way appealing. Overstay and there’s a real risk of detention and deportation. And I doubted the authorities would be very accommodating with Emma my trusty steed. Wasn’t quite sure what to do. No immediacy. Yet. So I’d elected to do something productive whilst I’d considered the situation. Mulling over the options. A haircut. It had helped, bar the slightly worrying moment when a young woman had beckoned me to follow her into the back of the shop. A massage parlour. To wash my hair. Perhaps I’d been overly confident with my strategy for China. Make full use of my three month visa, immerse myself in the country and its culture. With the benefit of cooler conditions in the western deserts, and less chance of encountering a typhoon or tropical storm further east. It came with risk, a reduced ability to absorb the unexpected into the plan, and less daylight for riding later on. I’d known the winds could be challenging, but their strength and persistence had been far greater than anything I’d expected. Whatever hindsight might make of my strategy, further self-analysis wasn’t going to get me to Hong Kong. Besides, I found myself feeling fairly comfortable it’d been a good call based on what I knew at the time. Had been sufficiently diligent in my research. This project was always going to be about problem solving, and I’d now a very simple one to address. Put some time back into the programme. First and foremost I wanted to see China. So far much of it had been desert, as enthralling as it was challenging. But, odd though this may sound, it was getting a bit repetitive. 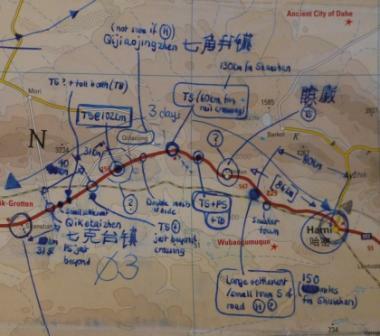 The toughest section – from Hami to Dunhuang – was complete. I’d learnt that the final section, along the Hexi Corridor east to the city of Lanzhou, was similar to much of the ground I’d already covered. But beyond it lay a very different China, greener, more mountainous, much more densely populated. Decided I’d jump ahead to Lanzhou. That’d be sufficient to give myself a realistic, but still challenging, programme to reach Hong Kong. And wouldn’t diminish my aim of experiencing as much of China as possible. A sensible compromise. There was just the slightly tricky question of how I’d achieve it. And promptly. I’d an idea… and I was sure it’d be an adventure all of its own. Epic days towards Hami from Ken Roberts on Vimeo. Fresh snow falls on distant peaks. I’d left the shelter of my room in the truck stop, pondering the plan for the day. The storm had passed, the last of the lightening shortly before sunrise. Thunder replaced by the frequent rumble of lorries on the highway. The wind had subsided a little, no longer gale force, but still strong, gusting. Marginal for riding. I’d still quite a bit of climb yet to come, but there was a chance they’d be more shelter higher up. Decided it’d be worth a shot. Progress was derisory at first. Battered by the wind, unpredictable in both strength and direction. Constantly changing. A landscape devoid of clues, not even a single tree. I’d at least been able to find a stretch of old road, parallel with the highway, allowing me to stay well clear of the many unfenced culverts or steep drops. A single truck stop late morning. By five civilisation. Toll station, beyond it a few buildings, a small shop. Respite. And a chance to glean something of the road ahead, my map already heavily annotated. Drawing a small crowd, albeit well-intentioned, it was soon time to move on. Downhill at last. A small village. Another truck stop and a bed for the night. I thought the usual quotation – "Keep your friends close, and your enemies closer" – hackneyed, even if it’s attributed to a Chinese military strategist. But, two and a half thousand years later, it does have an irritating aptness. Lorry drivers. The worst come perilously close, sucking you in towards their trailers, then spitting you out as they rumble past. Riding slowly uphill into a headwind, the wall of air those plunging downhill create can be sufficient to bring you to an abrupt halt. But, for all that, faced with genuine difficulty on remote stretches of road, it’d be lorry drivers I’d seek help from. No hesitation. Not all would oblige, but when assistance came, you just knew it’d be from a trucker. They’re the ones that often wave as they pass, give the thumbs up, offer water, keep an eye on you. Dare say there are car drivers who’d step in. Of course there are, but more likely they’d stop to take a photo and then head off. Busy people. I woke to find rivulets of rainwater running across the plain wooden table beneath the window. Driven in around the ill-fitting frame, gusts strong enough to make it visibly vibrate. The storm had taken out the power before I’d retired to bed, exhausted. Now the only illumination was the frequent violent lightening flashes. 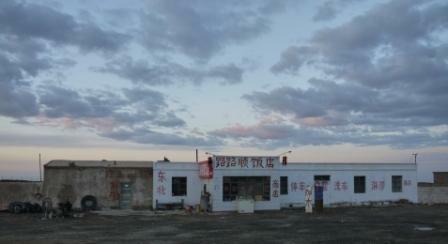 I’d left the town of Shanshan earlier in the day, the start of a three day, two hundred mile crossing through the mountains that separate the Turpan and Hami Basins. About five thousand feet of climb. Precious few truck stops or settlements until the latter part of the second day. By mid-afternoon I’d passed the last of the irrigated green strips, returning to the dull, grey, loose rock of the desert. The wind grew steadily, at first quite pleasant. A cooling tailwind. Then, gathering strength, it shifted ever more towards the side, riding becoming increasingly difficult. A landscape devoid of features, I’d no option but to press on towards where I thought there might be a truck stop. Passing lorries provided all too brief respite from the wind. And then, slowly, a convoy of three trucks began to draw past, the ageing vehicle at the front struggling with the climb. Suddenly free of the cross wind, I found myself able to keep up, much to the surprise of the driver who’s truck I’d paired up with. His passenger hung out of his window to pass down bottled water. Even offered me a cigarette. Sometimes they’d be a brief spurt of speed, but we’d soon resume a more sustainable pace. I’d the sense of a storm gathering astern, catching up rapidly. Soon heavy droplets of rain. Then thunder, at first distant, but closing quickly. Passed the point where I’d expected to find a truck stop. Nothing. Exposed ground making camping an unenviable choice, the rain deterring seeking shelter in a culvert. Onwards. Suddenly, on the far side of the road, a small building, single lorry parked up, a few old vehicles abandoned in front. I waved goodbye to my unexpected hosts for the last ten miles or so and broke away to seek shelter. It wasn’t a case of if I was stopping here. Not in the desert. And no need to show my magic card, explaining my endeavour in Simplified Chinese. I could have a bed for the night. Stubborn? I’d half regretted asking whether or not the Caucasus lay in Europe or Asia. Resigned myself to accepting it to be a geo-political question, rather than the straightforward "yes no" one I’d hoped for. This time it was deserts, and I’d already unearthed a wide diversity of opinion. I’d also thought the geography of the Central Asian states a bit tricky, their sometimes arbitrary borders, ethnic groups spread across nations. But simple sand seemed much more difficult to grasp. Question was, which desert was I in? That I was in one was irrefutable. Arid, sparse vegetation, little rainfall. What was less clear was its name, if indeed it had one. I’d sought to simplify the problem by starting with Basins. There were a few. Imagined them to be large sand pits, so, in all probability, it seemed likely they’d be closely allied to the various deserts. It was a theory. Of sorts. There was the Turpan Basin. I’d crossed it a little while ago, spent a day in its only decent sized town. Mostly below sea level so also termed a Depression. To the west the Tarim Basin, home of the Taklamakan desert. Little dispute about that. 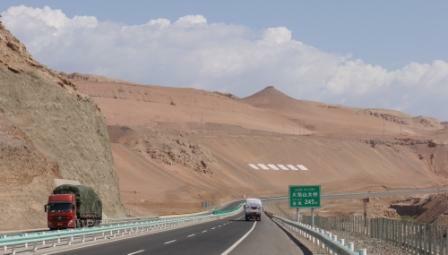 To the east of Turpan lies the city of Hami – Kumul in the local Uyghur dialect. It too sits in a Depression. Beyond the Hami Basin are what most seem to regard as the western fringes of the Gobi desert. Fifth largest in the world, and Asia’s biggest. Much of it is in Mongolia, encroaching on the north western and north central Chinese provinces of Gansu and Inner Mongolia respectively. My route east of Hami as far as the city of Lanzhou. Over a thousand miles. Some cite the Gobi as extending as far as the Pamir mountains in the west, encompassing the Turpan and Hami Basins, and the Taklamakan desert. I’m not convinced. Reckon there are two distinct deserts – the Gobi and Taklamakan – separated by the Turpan and Hami Basins. The dividing region may not have a convenient label, but, by any recognised definition, it’s still desert. No doubt about that.